What are the planets in our solar system? 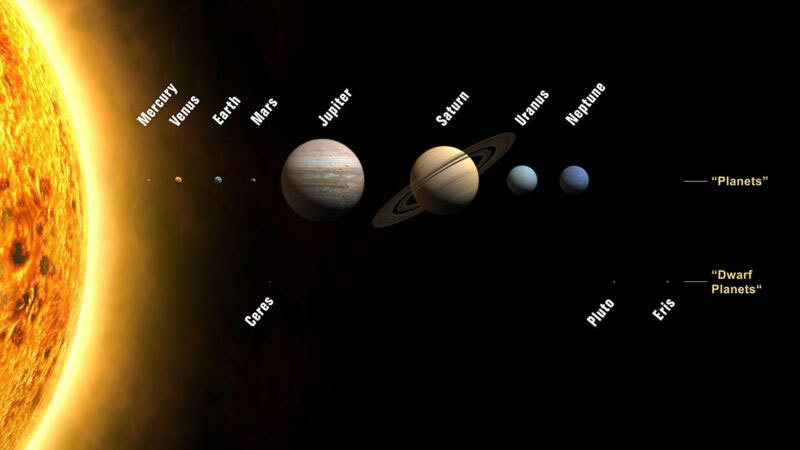 In addition to these eight planets, our solar system also has three “Dwarf Planets” or “Minor Planets”. These smaller planets are Ceres, Pluto and Eris. Pluto was classified as a regular planet until 2006 when it was demoted after a formal definition of what was a planet was established by the International Astronomical Union (IAU). Mercury, Venus, Earth, and Mars are composed of solid rock and are classified by the IAU as “terrestrials”. The next four planets – Jupiter, Saturn, Uranus and Neptune – are composed of various gases and are classified as “gas giants”. This video was taken by an amateur astronomer from Breclav in the Czech Republic. It is a nice compilation of amateur pictures, of various planets from the solar system including Juipter, Mars, Saturn and Venus. Also included are pictures of the International Space Stations (ISS), our Sun and Moon. The telescope used was a most likely the 10” Skywatcher Telescope N 250/1200mm.